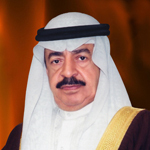 His Royal Highness Prince Khalifa Bin Salman Al Khalifa, the Honorable Prime Minister, was born on 24 November 1935. H.R.H started learning the Holy Quran at the hands of one of the most famous Sheikhs in Bahrain at that time. It was only a short time before he began his formal education. His father, H.H. Shaikh Salman Bin Hamad Al Khalifa, the Ruler of Bahrain, appointed a group of the most qualified teachers at the time to teach him basic subjects before joining the Government School. In 1957, he was sent to study in Britain at intervals until 1959. 26 Aug 1958	Acting Secretary of the Government of Bahrain. 19 Jan 1970	Chairman of the State Council. Hobbies and fields of Interest H.R.H. regularly exercises walking. H.R.H. prefers this particular sport to allow him the opportunity to meditate and think about the issues that concern him. Ancient artifacts, especially weapons and cars, are also among his interests. The hobby that H.R.H. loves is drawing. H.R.H. continues to follow closely all the new updates in this field. Agriculture, horticulture, and interest in birds and wildlife are some of H.R.H hobbies. Photography is also one of H.R.H.’s favorite hobbies. H.R.H. is highly interested in international economic and political affairs as well. 3 April 1952 The First Class Order of the Two Rivers (or Wisam Al-Rafidain ) , Iraq . March 1958	The National Order of the Cedar, the highest honour in Lebanon, bestowed by H.E. Sami El Solh; Prime Minister of the Republic of Lebanon. 24 Sept 1960	The First Class Commander Order of Dannebrog, Denmark . 19 Dec1976	The Order of Al Khalifa (Al Khalifa Collar); the highest order in Bahrain by Amiri Decree No. 8 of 1976, bestowed by the Late Amir H.H Shaikh Isa Bin Salman Al Khalifa, Amir of the State of Bahrain. 30 Jan 1999	The Supreme Order of the Renaissance bestowed by Prince Abdullah II bin Al-Hussein, Crown Prince of the Hashemite Kingdom of Jordan. It is the highest Jordanian Award. 4 Oct 1999	The Order of Shaikh Isa Bin Salman Al Khalifa ( Wisam al-Shaikh Isa bin Salman Al Khalifa), first Class, by Amiri Decree No. 20 of 1999, bestowed by His Majesty King Hamad Bin Isa Al Khalifa, King of the Kingdom of Bahrain. 30 Jan 2001	Grand Commander of the Order of the Defender of the Realm, bestowed by the King of Malaysia. 31 Jan 2001	An Honorary PHD Degree in Political Science from the International Islamic University Malaysia (IIUM). 16 Nov 2001	The Order of Sikatuna, (Orden ni sikatuna) bestowed by H.E. Gloria Macapagal- Arroyo, President of the Republic of Philippines. 3 Dec 2003	The Knight Grand Cordon (Special Class) of the most Exalted Order of the White Elephant, Kingdom of Thailand. 21 Feb 2004	The National Order of the Legion of Honour, Ordre national de la Légiod'honneur , bestowed by H.E. Jacques Chirac, President of the Republic of France. 21 Feb 2004	An Honorary PHD Degree from the Indira Gandhi National Open University, Republic of India. 23 Mar 2004	The Order of Ouissam Alaouite, bestowed by His Majesty King Mohammed VI, King of the Kingdom of Morocco. 2 Feb 2005	The Union Medal, bestowed by H.H. Shaikh Khalifa Bin Zayed Al Nahyan, President of the United Arab Emirates. 13 Apr 2005	The Outstanding Achievement Medal, bestowed by the President of the Council of Representatives in the Republic of the Philippines. 4 Jan 2007	The Order of Lakandula with rank of Supremo (Grand Collar); the highest Filipino Order given to leaders and head of states and governments. Bestowed by H.E. Gloria Macapagal- Arroyo President of the Republic of the Philippines. 2 July 2007	"2006 Special Citation of the UN-Habitat Scroll of Honour” from the United Nations Human Settlements Programme in Geneva, Switzerland. 24 Jun 2008	The Degree of Doctor of Humanities from Lawrence Technological University- United States of America bestowed from the President of the University. 11 Apr 2009	Order of King Abdul Aziz ( King Abdulaziz Medal) which is the highest Saudi rank bestowed by H.M. King Abdullah bin Abdul-Aziz Al Saud, King of the Kingdom of Saudi Arabia. 13 Aug 2009 Honorary Doctorate Degree in Political Science from Prince of Songkla University in the Kingdom of Thailand , bestowed by the President of the University. 12 Oct 2009 UNESCO Avicenna Gold Medal, bestowed by the General Director of UNESCO in Paris, Republic of France. 19 Oct 2009	Golden Shield from the Chamber of Commerce and Industry Paris, given to leaders and heads of states. 21 Oct 2009 H.M. the King of Bahrain granting H.H. the title of “His Royal Highness Prince”. 20 Nov 2009	Visionary Award 2009 of the Union of Arab Banks. 13 Dec 2009	King Hamad Order of the Renaissance 1st class ( Wisam al Nahda) bestowed by H.M. King Hamad Bin Isa Al Khalifa, King of the Kingdom of Bahrain, marking the Celebration of the Kingdom of Bahrain on the National Day and the accession to the throne. 4 Apr 2010	Golden Shield which is the Arab Jurists Union’s top Award, bestowed by the Union’s Permanent Bureau members. 19 Sept 2010	Millennium Development Goals Award from the United Nations. 8 Oct 2012	African Union Shield, bestowed by Dr. Jean Ping, Chairman of the African Union Commission. 20 Nov 2013	European Award for International Relations Personality of the Year 2013 by the Union of Arab Economists and Administrators in the European Union. 14 Dec 2013	Statesman Award from Asian Business Leadership Forum in Dubai, United Arab Emirates. 8 June 2014	The International Federation of Business and Professional Women (BPW International) President’s Gold Award. 29 Feb 2016	The Information and Communication Technology in Sustainable Development Award by the International Telecommunication Union (ITU) in the United Nations. H.R.H is the first Arab Prime Minister to be honored by ITU, being among leaders who strongly support the use of ICT in achieving sustainable development goals. 22 Mar 2016	2016 International Leadership Award from the International Federation of Training and Development Organizations (IFTDO). The award is reserved for leaders who have an impact on the masses. H.R.H is the first person to be honored with a new international award for leadership. 30 Mar 2016	The Flame of Peace Award from the Association for the Furtherance of Peace, Austria, thus becoming the First Arab Prime Minister to have received such a prestigious Award. 22 Oct 2016	The Order of the Golden Fleece from the Royal Habsburg family and Hollabrunn City Council, Austria. 11 April 2017	An Honorary PHD Degree from Al-Quds Open University. Bestowed by H.E. Mahmoud Abbas, Palestinian President during his visit to the Kingdom of Bahrain. 19 April 2017	The Arab League Shield for Leadership in Arab Development from the Arab League. H.R.H. became the first Arab leader to be honoured with a pioneering regional award. 18 May 2017	UNESCO Peace Medal carrying the word “ peace” in all official languages of the United Nations, which are English, French , Arabic, Spanish, Russian and Chinese, Bestowed by Irina Bokova, UNESCO Director – General during her visit to the Kingdom of Bahrain in H.R.H.’s Palace in Riffa. 20 Sept 2017	The World Peace Culture Award from the Federation of World Peace and Love (FOWPAL). Bestowed by Dr. Hong Tao –Tze, President of the Federation of World Peace and Love (FOWPAL) in New York. 12 Dec 2017	His Majesty King Hamad Bin Isa Al Khalifa , King of the Kingdom of Bahrain, visited the Southern Governorate where he launched the “ Khalifa Town” , a milestone which combines the Southern Town Housing projects, linking Askar, Jaw, Al Dur and their suburbs. The new city named after H.R.H. The Prime Minster, is in recognition of the H.R.H.’s landmark achievements and valuable contributions to the nation.